Answer: Acid rain has a huge effect on water. But before we get into the specifics, let’s clarify just what acid rain really is. Rain in remote areas, far from the influence of urban pollution, consists of water (H2O) along with trace amounts of dissolved gases and dust. It has a pH ranging from 5.0–5.5 so it is slightly acidic — a pH of 7.0 is considered neutral. In urban and industrial areas the oxide concentrations are far above natural equilibrium. Emissions from transportation, manufacturing, power generation, and agriculture will accelerate these reactions. All four acids are present in acid rain. Droplets too tiny to fall as rain stay suspended in the air, and can be inhaled and deposited in the throat and lungs causing irritation. The pH of acid rain normally ranges from 4.0–5.0, but in extreme cases can reach 2.0–3.0. That’s acidic enough to erode many metals and types of stone, as you’re seeing happen in New Delhi. where aH+ = moles of hydrogen ions per liter of water. So clearly there can be pH values lower than 0 and higher than 14.0, but they’re uncommon outside of a chemistry lab. So how does acid rain affect water? As you might expect, it makes the water more acidic. That applies to both fresh water lakes as well as the oceans. Geological records indicate the oceans historically had an average pH = 8.2. Today it is 8.1. That doesn’t sound like much acidification but it’s killing the reefs. 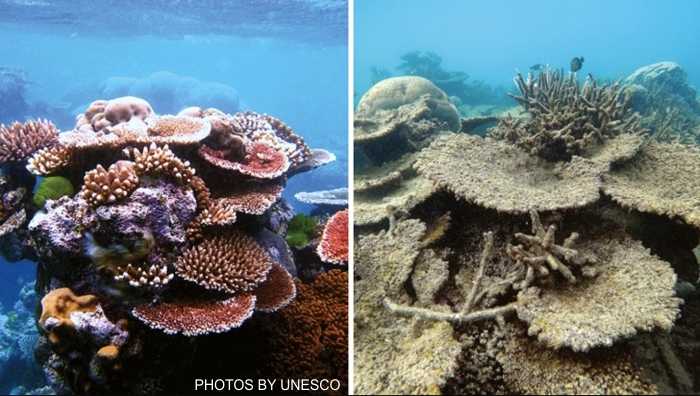 The photos above show healthy coral (left) and bleached dying coral (right). Acid dissolves the calcium carbonate “skeletons” of coral and also weakens shellfish. Another source of acidification is runoff into rivers feeding lakes or oceans. Agricultural fertilizers, pesticides, and other chemicals washed off the land by rain ultimately make their way to bodies of water. Many of these pollutants also decrease pH when in solution or suspension. 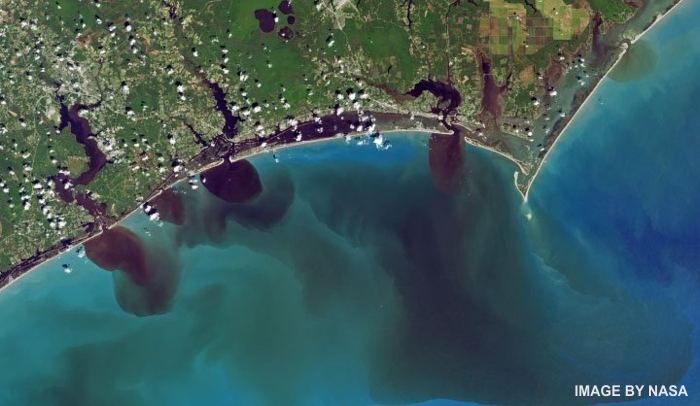 The image below shows exacerbated runoff from the Carolinas after Hurricane Florence in 2018. Click to enlarge. 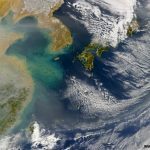 Near coastal areas with dense industry, plumes of air pollution can drift seaward carrying additional oxides of carbon, nitrogen, and sulfur. 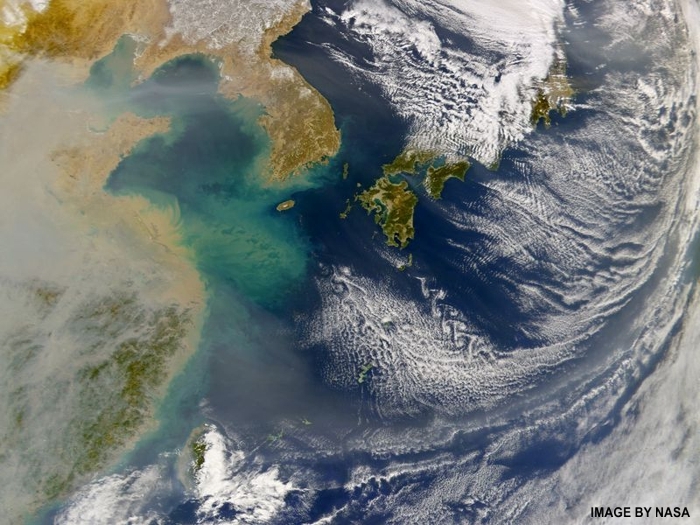 This NASA image shows such a plume drifting eastward off the coast of China. It will also end up in the oceans — via rain or the mechanism described in the following paragraph. The largest source of acidification is CO2 absorbed directly from the atmosphere in the surface layers of the ocean, where wind and waves mix air with water to form carbonic acid. 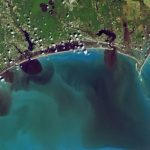 Unlike intermittent coastal acid rain or river-borne pollutants, this happens continuously over the entire ocean — 71% of Earth’s surface. IPCC estimates that about a third of the excess carbon dioxide generated globally gets absorbed by the oceans. That’s good for global warming, but bad for the ocean ecosystem. So the answer to your question is: Yes, acid rain hurts any body of water. It’s a different type of damage than that suffered by buildings and statues and lungs, but it’s damage nonetheless. Unfortunately, it’s not as obvious as what you’re seeing in New Delhi — unless you look for it.